(STATS) – The Big Sky Conference ended September with disappointing nonconference results, but the nation’s largest FCS conference rebounded nicely in October. As it enters the stretch drive of November, the Big Sky has four teams in the STATS FCS Top 25 for the first time this season – as well as a superb title race. Top-ranked James Madison again led the way in the national media poll on Monday as the top six teams remained the same following victories. There’s a logjam of Big Sky teams in the Top 25 as well as in the conference standings, but the picture should clear up further on Saturday. Coming off a bye, No. 11 Eastern Washington (5-3, 4-1) will host No. 19 Weber State (6-2, 4-1); No. 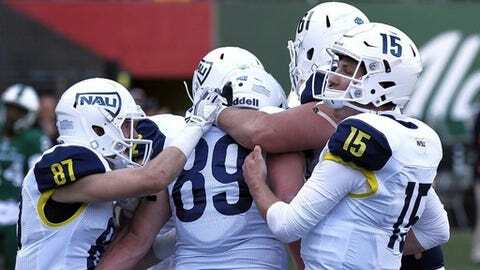 18 Northern Arizona (6-2, 5-0) will put its first-place lead on the line at Montana (5-3, 3-2), which was just knocked out of the ranking by Weber State; and No. 17 Southern Utah (6-2, 4-1) hosts preseason favorite North Dakota, which has had a disappointing season. Add in that unranked Montana and Montana State hope to get hot and play each other with an FCS playoff spot on the line Nov. 18, and the 13-team Big Sky has a deep fight to the finish line. The power conferences continued to dominant in the Top 25. CAA Football and the Missouri Valley Football Conference both had five representatives, the Big Sky and Southern conferences four each, and the Southland Conference three. Top-ranked James Madison (8-0) shut out New Hampshire 21-0 in the CAA for its 20th straight win, the high in Division I. The defending national champ had 156 of the 162 first-place votes and 4,044 points to outdistance No. 2 North Dakota State (8-0). The Missouri Valley leader, which beat Northern Iowa 30-14, earned the other six first-place votes. Jacksonville State (7-1) held strong at No. 3 after defeating Southeast Missouri 23-7 to extend its record of consecutive Ohio Valley Conference victories to 29. Southland teams Central Arkansas (7-1) and Sam Houston State (7-1) were Nos. 4 and 5, respectively, followed by South Dakota (7-1), Elon (7-1), Wofford (7-1), North Carolina A&T (8-0) and South Dakota State (6-2). After Eastern Washington, it was Illinois State (6-2), Grambling State (7-1), Stony Brook (6-2), Western Illinois (5-3), Samford (5-3), Southern Utah, Northern Arizona, Weber State and Villanova (4-4). Rounding out the rankings were New Hampshire (5-3), McNeese (6-2), Furman (6-3), Western Carolina (6-3) and Kennesaw State (7-1), the third-year Big South program making its first appearance in the rankings. Four traditional FCS powers fell out of the Top 25 following losses – Richmond, Youngstown State, Delaware and Montana, which have all captured at least one FCS national title. The Top 25 is released every Monday afternoon during the regular season, except for Sunday morning, Nov. 19, prior to the selection of the 24-team FCS playoff field. A final Top 25 will follow the FCS championship game, which will be held Jan. 6 in Frisco, Texas.